Today’s researchers have access to more information than ever before. Yet the new material is both overwhelming in quantity and variable in quality. How can scholars survive these twin problems and produce groundbreaking research using the physical and electronic resources available in the modern university research library? 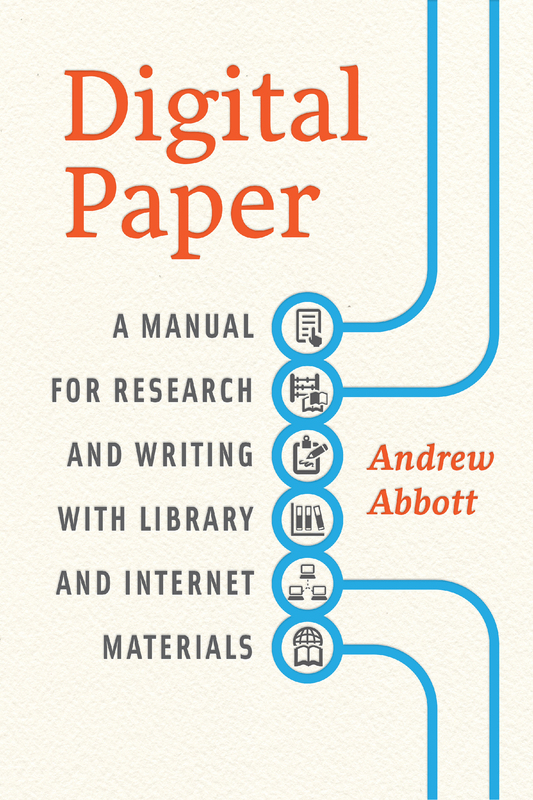 In Digital Paper, Andrew Abbott provides some much-needed answers to that question. Abbott tells what every senior researcher knows: that research is not a mechanical, linear process, but a thoughtful and adventurous journey through a nonlinear world. He breaks library research down into seven basic and simultaneous tasks: design, search, scanning/browsing, reading, analyzing, filing, and writing. He moves the reader through the phases of research, from confusion to organization, from vague idea to polished result. He teaches how to evaluate data and prior research; how to follow a trail to elusive treasures; how to organize a project; when to start over; when to ask for help. He shows how an understanding of scholarly values, a commitment to hard work, and the flexibility to change direction combine to enable the researcher to turn a daunting mass of found material into an effective paper or thesis. More than a mere how-to manual, Abbott’s guidebook helps teach good habits for acquiring knowledge, the foundation of knowledge worth knowing. Those looking for ten easy steps to a perfect paper may want to look elsewhere. But serious scholars, who want their work to stand the test of time, will appreciate Abbott’s unique, forthright approach and relish every page of Digital Paper. "With illuminating examples from social science and humanities research, and with self-deprecating humor, Abbott develops an economic model describing tradeoffs between searching and reading. . . . Essential."